During past few years, grain-free diets have gained massive popularity amongst people, so, it’s no wonder that many dog owners want to feed their pets with grain-free dog food. In fact, this trend is so prevalent that the variety of food choices can be overwhelming. Furthermore, most people choose to transition their pooch into a new diet because they’re led to believe that dogs can’t digest grains. This common misbelief stems from the fact that wolves didn’t eat grains. As much as this is true, dogs evolved and are now considered omnivore animals. Therefore, they can eat both animal and plant-based nutrients. However, some dogs can become allergic or have troubles digesting certain grains and can benefit from eating grain-free food. If this is the case for you, your dog still needs to have a complete, balanced, and nutrition filled diet: something not all available formulas can provide. Luckily, we did extensive research on this subject and compiled a list of the best grain-free dog food in 2018 to make your search easier. What Is The Best Grain Free Dog Food In 2018? CANIDAE made this limited ingredient no grain formula to suit the needs of dogs with food sensitivities. At this price range, this product is one of the best senior dog food grain-free formulas because it’s made specially to suit the needs of older dogs. In this senior formula, the main ingredient is chicken, followed by chicken meal, and turkey meal. These are all acceptable meat proteins that make a 28% of crude protein required for healthy muscle tissue. Additionally, sweet potatoes, chickpeas, peas, and potatoes are all easily digestible carbohydrates in this grain-free formula. And with a maximum of 5% crude fibers, your dog will not experience any allergies or stomach issues caused by grains. Chicken fat is also included to keep your senior pooch full of energy and is the primary source of fat in this formula. And with a minimum of 10% crude fat, your dog’s coat will be healthy and shiny; meaning all his skin problems will be the thing of the past. Besides keeping your dog’s coat healthy, this well-balanced senior formula contains all the necessary vitamins like A, B12, and D3 to maintain a robust immune system. All the required minerals are also included to improve the health state of your dog. Since its main ingredient is novel protein, salmon, this formula of grain-free dog food is excellent for dogs with sensitive stomachs. If your dog doesn’t like salmon, this zero grain line is available in three other flavors: chicken, beef, and turkey. In the salmon version, the main ingredient is easily digestible real salmon, which is followed by chicken meal, and menhaden fish meal to a variety of meaty flavors. With a minimum of 26% crude protein, this is a well-suited formula for puppies and adult dogs. To reduce the chances of stomach issues, easily digestible sweet potatoes, dried peas, and tapioca are included as the primary sources of fiber. And with a maximum of 5% of crude fibers, this is a healthy zero grain choice for dogs with food and skin allergies. Furthermore, whole flaxseed and chicken fat make sure your pooches’ coat stay healthy and helps speed up the skin recovery after rashes and constant scratching. Also, the 14% crude fat will make sure your dog has all the energy they need and a soft/radiant coat. Beet pulp is this dog food’s natural source of prebiotics, and this means the formula has all the necessary vitamins and minerals. Due to this, it’s clear Rachael Ray’s Nutrish Zero Grain formula is well-balanced and suitable for daily feeding. AvoDerm made this grain-free canned dog food with premium ingredients like extremely healthy avocado fruit to help you bring some diversity into your dog’s diet. In this canned version, the main ingredient is turkey, followed by turkey broth, and turkey liver. With 8.5% of crude protein and a variety of meaty flavors, this is a formula suitable for dogs of all different sizes. As the primary sources of carbohydrates, easily digestible carrots and peas are full of healthy vitamins and fiber suitable for stomach problems. See, they provide a maximum of 2% of crude fibers that won’t cause allergies or gastrointestinal problems. Unlike a lot of other dog formulas, the primary sources of fat are flaxseed and avocado oil, which are both extremely healthy. Together, these two fat sources have 5% of crude fats. These crude fats will keep your dog’s coat/skin in good shape through helping them recover from red spots and damages caused by scratching. Overall, this food is a complete and balanced option filled with healthy and fresh ingredients that contain all essential vitamins and minerals. Also, it contains Omega 3 and 6 fatty acids for a healthy coat and skin. This brand makes premium quality, affordable grain-free dog food that comes in a variety of different flavors. In doing so, it’s no surprise that this formula is suitable for all dogs, which makes it a convenient choice for multi-dog households. In this convenient dog food, the main ingredient is chicken meal that is a high source of protein suitable for puppies, adult, or senior dogs. Also, the 26% of crude protein it carries will be beneficial for your dog’s muscle tissues. Along with helping your dog’s muscle tissues, this dog food has easily digestible sources of fiber like dried potatoes and peas that will keep your dog’s belly full without making them gain weight. Plus, you add in the 4.5% of crude fiber, and you shouldn’t be shocked this is an easily digestible dry dog food suitable for dogs with grain allergies and sensitive stomachs. Likewise, the primary source of fat is chicken fat that attests to 13% of crude fat. Fat is the primary source of energy but also an ingredient that will repair and maintain the state of your dog’s coat and skin. All in all, Whole Earth Farms created this formula to contain all the necessary vitamins and minerals required for a robust immune system and general health. Without any artificial flavors, colors, preservatives, and by-products this is a well-balanced and cheap grain-free dog food brand that doesn’t make compromises when it comes to ingredients. ZiwiPeak makes premium quality dog food from New Zealand’s human grade local ingredients. With quality in mind, this brand preserves meat by air drying it to eliminate bacteria while keeping all the necessary nutrients. They contain several different flavors of no grain formulas, and in this one, the main ingredient is beef, followed by beef liver, beef kidney, and beef heart. Together, they provide a minimum of 36% of crude protein that makes this easily digestible formula a protein powerhouse suitable for all dogs. Furthermore, this product is both a grain-free and potato-free dog food which makes it a suitable choice for dogs with skin allergies. And with only 2% of crude fibers, this nutritious food is ideal for dogs with food sensitivities and gastrointestinal problems. Additionally, unlike the others on this list, this is a chicken-free dog food. This dog food also is a limited ingredient zero grain formula that’s reinforced with chondroitin and glucosamine to support joint health. Since this is a protein-rich formula, it contains higher levels of kilocalories compared to other grain-free foods. But make sure you stick to recommended daily amounts labeled on the package. Also, includes are vitamins like E, B1, and D3 to make sure that your dog has a stable immune system and stays healthy. With all the essential minerals, this is a well-balanced grain-free diet made from extraordinarily healthy and high-quality ingredients. In general, Wellness is one of the best dog food brands. So, it’s no wonder that this formula is one of the best-rated dog foods with no grains on the market. 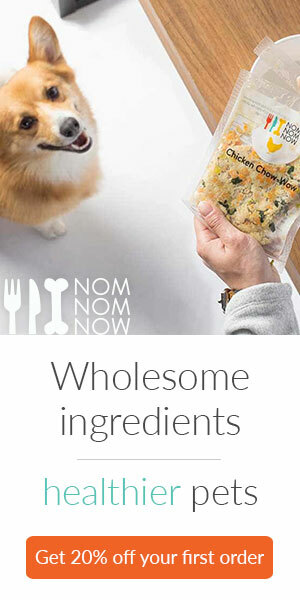 This brand always uses high-quality ingredients, and they make sure all their products cater to the needs of all dogs. In this high-quality dog food, the main ingredient is deboned turkey followed by turkey meal and chicken meal. They never make dog food with less than 36% of crude protein which makes this, like all other CORE formulas, a protein high dog food. Besides being a protein high dog food, CORE added in potatoes, peas, and ground dried potatoes as primary sources of fiber that are free of grains and suitable for food sensitivities and allergies. Also, this formula contains 5% of crude fiber that will keep your pooches belly full without causing diarrhea. As far as the fat content, the primary source is chicken fat that attests to not less than 15% of crude fat in this formula. This chicken fat is an excellent source of energ,y but will also help your dog’s skin recover and keep it healthy. Also, the variety of vegetables and fruits like broccoli, carrots, apples, and blueberries are sources of all the necessary vitamins. With plenty of minerals, this is a high-quality ingredient dog food suitable for daily feeding. Overall, this CORE product is the best grain-free small dog food on the market, After all, it’s full of healthy ingredients like spinach, the source of magnesium and iron, and Flaxseed, rich in omega 3 fatty acids, to keep your dog’s skin/coat in pristine condition. NUTRO developed this formula to help dogs with sensitive stomachs and grain intolerances. In their pursuit of this goal, they use only high-quality ingredients to provide your dog with all the necessary nutrients. Due to this, the main ingredient is chicken meal followed by lamb meal and chicken for a variety of tasty meaty flavors. Together, they make up 22% of crude protein to keep your dog’s muscles toned. Since this is a no grains food, it contains only easily digestible dried potatoes and chickpeas. When combined, they make a maximum of 3.5% of crude fibers that are easy to digest and won’t cause any allergic reactions. Likewise, the primary source of fat is chicken fat that will help with skin rashes caused by allergies and will maintain your dog’s coat shiny. And with a minimum of 14% of crude fats, you can be sure that your dog will have plenty of energy for their daily activities. To keep your dog healthy and his immune system, strong NUTRO included vitamins E, B2, B1, B6, B12, and D3 amongst others. Minerals like zinc and calcium are added as well to make this a well-balanced dog formula. Diamond Naturals made this formula from premium quality ingredients, and it’s suitable for all dogs. And with four formulas, you will quickly find the taste that your dog will enjoy. Within this dog formula, the main ingredient is chicken, followed by chicken meal, which are significant sources of proteins. Due to these protein sources, this food contains a minimum of 24% crude proteins to keep your dog’s muscles in perfect condition. Additionally, sweet potatoes and peas are included as easily digestible carbohydrates that won’t cause any gastrointestinal upset or allergies and will keep your dog’s belly full. It also has a maximum of 5% of crude fibers that makes it easy to digest and won’t cause vomiting or diarrhea. Regarding the fat content, the primary source is chicken fat, followed by flaxseed and fish oil that are excellent for skin and coat repair. It also contains a minimum of 14% of crude fat that will provide your dog with enough energy and keep their skin/coat healthy. To cover all the bases, this formula has tomatoes, cranberries, and blueberries as sources of vitamins that will keep your dog healthy and his immune system strong to prevent diseases. In fact, all the necessary minerals are included to maintain the health of your large dog. Diamond also included probiotics for a healthier gastrointestinal system and better digestion. Without any artificial colors, flavors or preservatives this is a premium quality food made from fresh ingredients. This brand creates food formulas to mimic dogs ancestral diet, and considering the quality this is the best-priced grain-free dog food. In doing so, Taste Of The Wild has produced many different flavored formulas that are all made from novel protein. With the Pacific Puppy grain-free formula, the main ingredient is salmon followed by fish meal for the tasty fishy flavor dogs love. This formula is also made from a minimum of 27% of crude proteins to fulfill all the nutritional needs of puppies. Concerning this formula fiber content, it contains easily digestible sweet potatoes, peas, and potatoes that are excellent sources. And with a maximum of 5% of crude fibers, this is a perfect formula for allergies and puppies with food sensitivities. Besides being an excellent source of fiber, this dog food’s primary source of fat is canola oil, followed by salmon oil to promote great looking skin and coat. Due to its minimum of 15% of crude fats, this food will give your still growing puppy enough energy. Moreover, the tomatoes, blueberries, and raspberries inside this formula have enough vitamins to create a strong immune system and keep your still growing puppy healthy. Also, all the necessary minerals are included for optimal health and development. Furthermore, dried chicory root is added to the mixture to help with digestion, and omega 3 and 6 fatty acids are mixed in to promote healthy skin and coat. When used together, all these nutrients make this formula an excellent choice for still-developing puppies who have stomach sensitivities or tendencies for food allergies. This brand makes protein-rich formulas to be similar to a wolf’s diet, and this one is zero grain for dogs with food sensitivities. In other words, it’s a premium quality food made with fresh and high-end ingredients. In being a high-quality food, this formula contains deboned chicken as its number one ingredient, followed by chicken meal to create a protein-rich grain-free formula. Due to its minimum of 34% crude proteins, your dog will get plenty of energy from fresh ingredients for optimal muscle tissue. Also included are healthy carbohydrates like peas and potatoes that are easy to digest and won’t cause any allergies and stomach upset. And this formula contains a maximum of 6% of crude fiber which is plenty to keep your dog’s tummy full of healthy ingredients. In this formula, flaxseed is the primary source of fat and also a source of omega 6 fatty acids that maintain and repairs your dog’s skin/coat. Additionally, this dry food contains a minimum of 15% of crude fat thar will give your pooch enough energy to keep them active during the day. With all their food formulas, this brand uses LifeSource Bits that have a precise amount of antioxidants, minerals, and vitamins to support the immune system. These are mixed with regular kibble to provide the ultimate use of all healthy nutrients every dog needs. Overall, the proteins and fats from this formula will provide your dog with healthy muscle tissue and plenty of energy for an active life. And the other high-quality ingredients are there to provide all the necessary easily digestible nutrients. If your dog is suffering from food sensitivities caused by grains, you should put them on a grain-free diet to keep them healthy. However, you still need to make sure that your dog’s new food contains all the necessary nutrients that will fulfill their dietary needs. Grains, commonly referred to as cereals, are edible seeds of particular grasses that are high sources of carbohydrates. Usually, refined grains are ones that can cause food sensitivities in dogs, but they’re also whole grains that are considered healthy sources of fiber. Although dogs are omnivores and can digest grains, they can become allergic to them. Also, you should know that dogs can become allergic to some types of meats, and that grain allergy isn’t so common as people think. If you notice your dog’s having any of these symptoms, you should take him to the vet, so, they can determine what’s the underlying issue causing the reaction. For example, if your dog is allergic to beef, it makes no sense to spend money on the best grain-free dog food. Is Grain Free Dog Food Also Considered Gluten Free Dog Food? The simple answer to this question is no. However, some grains like rice, cassava, and corn are gluten-free. So, if your dog is suffering from Celiac disease, maybe go out and find a corn-free dog food. – Chronic gastrointestinal upset: Presents with chronic diarrhea or constipation. In some cases, dogs can experience excessive vomiting. – Dermatitis: Causes the skin to be red, dry and flaky, in some cases hair loss is present. Constant scratching and rashes are also common symptoms. – Chronic ear infection: Is caused by excess sugar build up in the system, this leads to unhealthy amounts of earwax. Caused by excess sugar build-up in the system which leads to unhealthy amounts of earwax. What Are The Main Benefits Of This Diet? – Easier digestion: Foods that contain refined grains are harder to digest. In comparison, dog foods that are made of whole grains or don’t have them at all are easier to digest and won’t cause stomach problems. – Nutrition: Often, some manufacturers will put a carbohydrate as the main ingredient in their formula. When you feed your dog with a zero grain food, you can be sure that this won’t happen. – Weight management: Zero grains formulas are made from healthy vegetables and usually have low to moderate carb content. If appropriately fed, this type of food won’t cause weight gain and obesity. – Allergies: Wheat and soy are one of the most common grain allergen. If your dog is allergic to these or other grains, they should eat zero grain food. What To Look For In No Grain Dog Food? – Main ingredient: To fulfill all of your dog’s dietary requirements, your dog food’s main ingredient should always be protein. Due to this, look for food formulas that have a meat-based protein as the first ingredient listed. – Sources of carbohydrates: This is very important when you are buying a no grain food. Many manufacturers will pack their product with unhealthy carbs to substitute for grains. Therefore, you should look for foods that have healthy vegetables like sweet potatoes, peas, and carrots. – Vitamins and minerals: Since they’re excellent sources of vitamins, it’s essential you look for formulas that contain fruits. Also, make sure you read the label carefully to see if minerals like calcium, zinc, and potassium among many others are present. – All natural ingredients: A healthy and well-balanced diet should not contain any artificial flavors, colors, preservatives, or flavor enhancers. Look for zero grain formulas made from premium quality fresh, natural ingredients. Pet stores are full of no grains dog formulas, but not all of them will provide your dog with all the nutrients they need for healthy and happy life. Thankfully, our list of best grain-free dog food contains only high-quality brands at different price ranges to suit everyone’s needs. And although dogs can digest grains, some dogs have allergies or digestive problems when they eat them, so it’s essential to make a switch to a zero grain option. Due to this, we advise you to take your dog to the vet if you notice any signs of allergies to determine what ingredient is causing the issue.